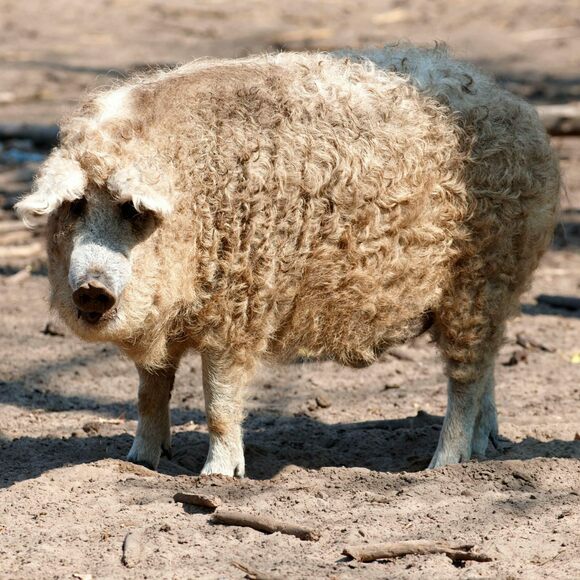 Looking like a pig crossed with a sheep, the Hungarian mangalica is a unique breed. Only two decades ago, the world’s last woolly pig was on the verge of extinction. Thankfully, it has re-emerged across Central and Eastern Europe, while also becoming a gourmet staple in local restaurants. The name means “hog with a lot of lard,” an appropriate moniker, as the mangalica is one of the fattiest pigs in the world. Creamy, white fat threads through its meat, which is often used to make cured hams and sausages. With its rich, bold flavor, mangalica meat is considered one of the tastiest types of pork. Some even refer to it as the “Kobe beef of pork.” It’s often healthier, too: Mangalica meat is high in unsaturated fats, natural antioxidants, and omega-3 fatty acids. This tasty swine almost died out under Communism, when farmers had to focus their efforts on mass porcine production at the expense of flavor. The population of mangalica pigs dwindled so much that by the 1990s there were fewer than 200 on farms scattered across Hungary. Mangalica has made a comeback, with the current population hovering around 50,000. The tasty pork now forms the backbone of Hungarian haute cuisine. In Budapest, the mangalica even gets its own culinary festival. The main mangalica pork product is sausage, which has been seasoned with sweet paprika, pepper, salt, and spices. It’s usually eaten in slices and served with pickles. Smoked ham is a popular mangalica product, too. This annual festival features plenty of mangalica dishes, as well as cooking competitions. Serbians prepare these cold, jellied pork cubes for even colder winters. This old-school Italian dish comes in a rich and savory wrapper. Pennsylvania's pork loaf embodies Amish resourcefulness.